Renault has announced they will announce something about "When the worlds of Formula 1 and electric cars meet...". 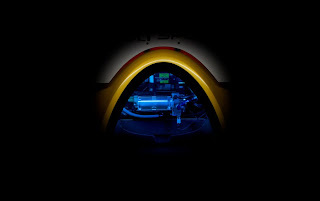 That obtuse announcement of a pending announcement was accompanied by a nearly useless picture showing something vaguely electric performance car related. I hesitated posting anything, preferring to wait until the April 25 announcement so I could have something solid to chew on. However last week there was news floating around that Renault is looking to get involved with the Formula E electric race car series. Renault's entire announcement read as so:- "On Thursday, April 25, Renault will present its latest concept car at its Valladolid plant in Spain. This prototype vehicle, which features muscular styling and impressive performance credentials, provides a bridge between the world of Formula 1 and that of electric vehicles. It's a concept car that will make a lot of noise... but in total silence." That report claims Renault is keen to get involved with the Formula E, should it actually launch in 2014 as planned. "Formula E is something that we are looking at very closely," Carlos Tavares, COO of the Renault group, told AUTOSPORT. "It's very probable to say that, if it happens, we will be involved in one way or another. Renault is the EV sales leader in Europe and the Renault-Nissan alliance is the sales leader in the world. [Formula E] is completely consistent with our mastery of the technology, and we're eager to use that platform to show to the people what we can do." Apparently Renault wants to see Formula E as an open racing series, rather than a spec racing series. The difference is that in a "spec" series, every vehicle in the race conforms to a tight specification and it might be that all race vehicles are made by the same manufacturer. Open racing series, on the other hand, are, well, open to vehicles from any manufacturer and have looser requirements. Autosport quotes the Renault spokesperson saying "There is a big difference between conventional racing and zero emission racing," Tavares explained. "A zero emission racing series is about promoting new technologies. If you are promoting this, you must realise that the best technology must win. Renault as the EV leader in zero emissions would want to compete in a championship to demonstrate [its] technology is the best. I would not like to be under the threat of Balance of Performance criteria, so I think we should be consistent with that. After all the role of motorsport, in its purist form, is to promote the efficiency of new technology." This sentiment is what brought me to pay attention to racing in the first place - because of the potential for electric racing to serve as a proving ground for electric technology. That, and to prove to the public that electric vehicles aren't slow boring ugly golf carts. So far the 2014 Formula E season is shaping up as a "spec" series with all the cars to be provided by Formula E. They'll be designed and manufactured by a consortium of Spark Racing Technologies (SRT), McLaren and Dallara. Even Drayson Racing, who has been showing their own electric race car design for a few years, will race in the 2014 Formula E using cars provided by Formula E.
What Renault's Tavares said isn't consistent with entering the 2014 Formula E using cars provided by Formula E. Leaves me wondering just what their announcement on the 25th will say.